The Philadelphia Eagles have agreed to terms on a five-year contract with linebacker Nigel Bradham. It is a $40 million deal, a source told ESPN's Adam Schefter. Originally selected by the Buffalo Bills in the fourth round of the 2012 NFL Draft, Bradham produced 428 tackles, 6.5 sacks, five forced fumbles, three fumble recoveries, two interceptions and 25 passes defensed in 88 career regular-season games (69 starts). He was first signed by Philadelphia during the 2016 offseason and leads all Eagles linebackers in tackles (184), sacks (three), forced fumbles (three), passes defensed (13) and defensive snaps played (1,913) over the last two seasons. In 2017, Bradham finished third on Philadelphia's defense with 85 tackles and added one sack, one forced fumble, one fumble recovery returned for a touchdown and eight passes defensed in 15 regular-season games (all starts). 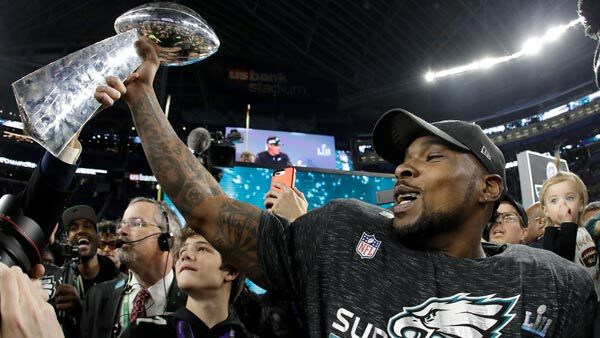 During the team's Super Bowl LII-winning postseason run, Bradham recorded 12 tackles, one sack and one pass defensed in three contests. Bradham recorded a third-down sack of Falcons QB Matt Ryan in the third quarter of the NFC Divisional Playoff to help set up a scoring drive that resulted in a game-winning field goal by kicker Jake Elliott. He also forced a fumble on a lateral play that was picked up by defensive end Brandon Graham and returned for a victory-sealing touchdown in the division-clinching win at L.A. Rams in Week 14. Bradham played collegiately at Florida State, where he amassed 306 tackles and nine sacks in 53 career games (39 starts). He led the Seminoles in tackles in three consecutive seasons from 2009-11 and earned All-ACC honorable mention accolades after totaling 86 tackles, two sacks, two interceptions and five passes defensed in 2011. "Nigel plays with tremendous energy and fire and has made a number of impact plays for us at the linebacker position. Keeping him here was a priority of ours and we are looking forward to his future here in Philadelphia," the team said in a statement.